Now that you know the basics of Link Monsters and Link Summoning, here are some common terms you should know when dealing with Link Monsters. Link Arrows: These are the big red triangles surrounding the picture of the monster. Only the red ones are Link Arrows. 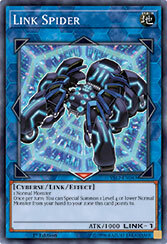 Link Rating: Link Rating is the number in the lower right hand corner of a Link Monster where the DEF would normally be located. This is the number of Link Arrows the monster has, and also the number of Link Materials you need to use to Link Summon it. Link Material: These are the face-up monsters on your side of the field that you use to Link Summon. All the monsters you use as Link Material must meet the specification on the Link Monster you’re trying to Summon. Normally, 1 monster = 1 Link Material, but when you’re Link Summoning with a Link Monster as Link Material, you can choose to use it as 1 Link Material, or to substitute its Link Rating as the number of Link Materials it counts as. It’s still only 1 monster no matter how many Link Materials it’s counting as. points to: The Monster Zones and/or monsters that are directly adjacent to the tip of a Link Arrow are the zones and/or monsters that Link Monster “points to”. A Decode Talker placed in an Extra Monster Zone, for example, points to the Main Monster Zone directly above it, as well as the Main Monster Zones diagonally downwards to the left and right. A Decode Talker placed in the center Main Monster Zone does not point to anything, as there are no Monster Zones directly adjacent to the tip of its Link Arrows. linked: A monster is “linked” if one or both of the following is true; 1. A Link Arrow is pointing to this monster. 2. This monster is a Link Monster and one of its Link Arrows is pointing to another monster. Consider Ib, the World Chalice Priestess from Code of the Duelist, who says “This linked card cannot be destroyed by battle or card effects.” If Ib is pointing to another monster, she can’t be destroyed by battle or card effect. If another Link Monster is pointing to her, she can’t be destroyed by battle or card effect. co-linked: Only Link Monsters can be “co-linked”. Two Link Monsters are “co-linked” if they have Link Arrows that point at each other. As of publication, no card uses this terminology. The first monster that will use it is Firewall Dragon from Code of the Duelist, which counts the number of monsters it’s “co-linked” to in order to determine the strength of its effect. In the following formation, Firewall Dragon is “co-linked” to 2 monsters: Link Spider and Honeybot. And that’s all the terminology you’ll need to know to play with the first two waves of Link Monsters! In addition to the 3 Link Monsters in Starter Deck: Link Strike, there are 10 more coming your way in Code of the Duelist. Whether you’re looking to extend the reach of your Extra Deck, build around the unique powers of a single, strong Link Monster, or go all-in on a dedicated Link Summoning strategy, we hope you’ll enjoy the new layers of strategy that are now possible thanks to Link Monsters!